The deity in the temple has left. The last and the most beloved of our founding Fathers has moved on. XLRI is orphaned. Yet we cannot complain. He has left the institution stronger than ever. The values etched deeply into its psyche, his life a lesson till he drew his last breath. No, we cannot complain – it has been a long innings and over the last few moths he was probably raring to get away. And today while prayers are being read and his favourite hymns are being sung, he is perhaps busy running on some playground, teaching some brash young kid how to basket the ball perfectly. Patting someone on the shoulder to say ‘You did well kid, I’m proud of you.’ Asking a young mother with a twinkle in his eyes ‘Are you being good?’ Saying in his inimitable style, ‘Ttheek hai? Achcha!’ Telling a rotund friend with a friendly wink and a loving nod, ‘hey aap zara mota ho raha hai!’ Asking a bright young girl, ‘where did you get those earrings?’ Keeping everyone around him laughing, making everyone around him feel loved. Feel warmth and gratitude and humility, but most of all, feel loved. A teacher extraordinary, whose classes became legendary; whose life became his teaching, has fallen silent, having said everything he had to say. Whose heart was always with the less privileged, who fought against the idea of starting a school for the elite and instead wanted to carry on with the dream of making India’s trade unions stronger and management more sensitive so that they could meet as equals. Who was most energized when he could help hundreds of youngsters in remote villages find a vocation they could be proud of. Who jumped on his bike at a moment’s notice, and rode off to fight the cause of some poor labourer who had been dismissed from work. He continued to spread his message even when he lay in bed for most of the last few years, with a rosary tucked under his pillow, or sat in his wheelchair, admiring all of God’s creations. A life lived by example where he watched everything around him in amazement – like a little child – the trees around his infirmary, the flowers, and the riverbed stones that paved the path to the garden. Exclaimed with admiration, at the birds that gathered every evening to receive the bits of bread and cake from his hand. Told anyone who would listen to him, ‘look at that!’ – the zebras with their perfect stripes, a lion being tossed on the horns of a bison, even the humble pigeon that he watched with equal wonderment on his favourite Animal Planet channel. A teacher who has left a little of himself in the hearts of everyone who met him, even for a brief moment. We will Father. We do. Rev. Fr. 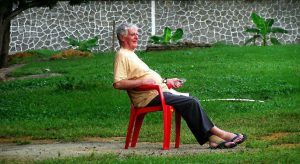 Edward Hugh McGrath SJ, 94, darling of the thousands of everyday folk in Jharkhand, Odisha and the Chhotanagpur areas, beloved teacher, loving colleague and friend, inspiring everyone who knew him, left for the blue beyond on Friday 4th August 2017, back in his little room in the Fr. Guidera Home and Infirmary at XLRI Jamshedpur after a long stint in the hospital.